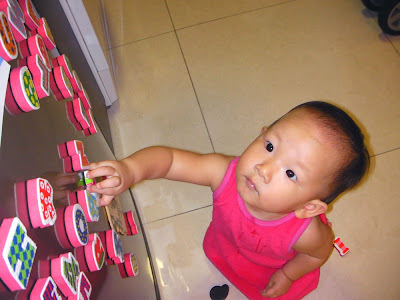 Natalie loves to play with the magnets on Lisa Yee-yee's fridge. Every time we go over for a visit, she will spend at least 5 minutes removing magnets, sticking them back on, throwing them around, and re-arranging them. Natalie wishes she were taller and could reach the magnets higher-up. Half cute toddler, half... monster?